The photographs tell a story in themselves: images that feel familiar because we recognize our city in the background, and all too familiar because we still see agitated people, most of them black, fleeing through clouds of tear gas or standing alone in front of police lines. But the photographs don't tell nearly enough of the story. That's because the images in the 1968 Riot Collection at the University of Missouri-Kansas City Library don't have enough information. 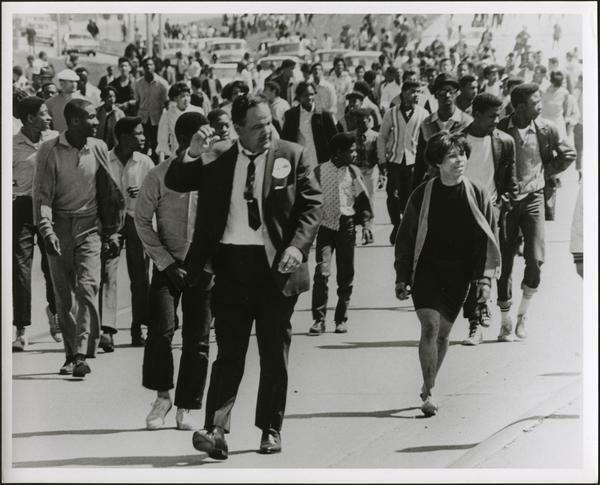 As KCUR prepares to mark the 50th anniversary of Martin Luther King, Jr.'s assassination and the Kansas City riots that followed — riots that went on for four days, costing the lives of six people and millions of dollars in damage — we want to know more. More often, though, there's simply a "Detained African American man with two police officers." 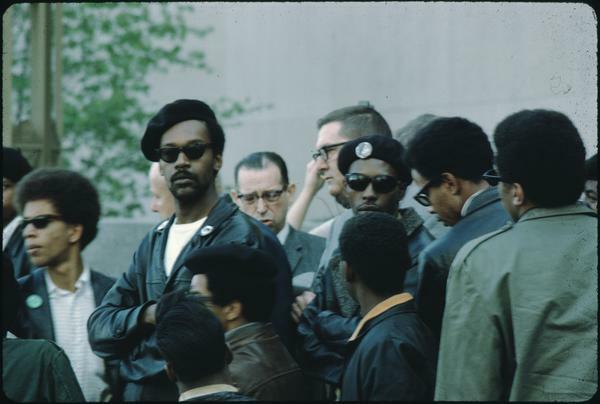 Or, "Black Panther leaders standing with crowd on the steps of the Court House." Or, "Six African American men standing in the back of a pickup truck and speaking to the crowd outside Central High School." Or an "African American woman holding an umbrella, walking near Central High School, looking over at the camera. She is wearing white pants and a striped shirt." There's also no information about who took the pictures, though we have good reason to believe many of them were taken by photographers for The Kansas City Star. The librarians who are entrusted with preserving this history also want to know more. At the bottom of the web page for each photograph, there's a request to send any information readers might have. 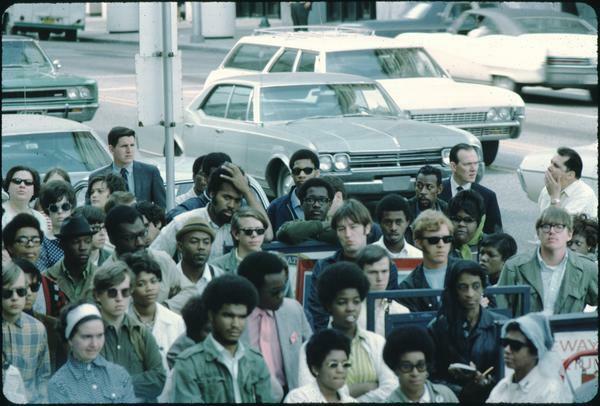 Immediately after the riots, city officials, scholars and others began assessing what had happened. 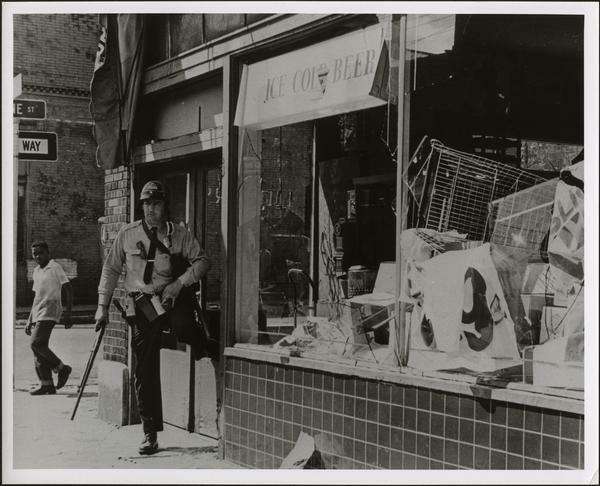 Among those was an organization called the Greater Kansas City Mental Health Foundation, which, with a grant from the National Institute of Health, commissioned two researchers named Robert Bechtel and Charles B. Wilkinson to write a history of the riots. From May 1968 through January 1971, Bechtel and Wilkinson conducted extensive interviews of witnesses, protesters and police, and eventually wrote a book that was never published. Eventually, Bechtel (now deceased) boxed up all of the materials and sent them to Joseph B. Hughey, who at the time was an associate dean of arts and sciences at UMKC. The box sat in Hughey's office for a few years, then he took it home. "I started digging into this one night and couldn't stop," says Hughey. "I saw these photographs, and diaries on old yellow legal paper. There are some absolutely tremendous first-person accounts in the written materials." Hughey knew some of the people who'd been interviewed through his work in the community — in fact, many of the names in the table of contents to the collection are well-known figures in Kansas City's civic life. Preparing to retire and move to New Mexico in 2007, Hughey took the box to the library. Now the photos have been digitized, and various writers for Scripts & Grooves: The Blog of LaBudde Special Collections and the Marr Sound Archives, have begun to relay some of the stories contained in the written materials. "I would love to have insight into some of the images, the people who are depicted in the images, people who participated in any aspect of the events," says Stuart Hinds, associate dean for collections and discovery services at the library. 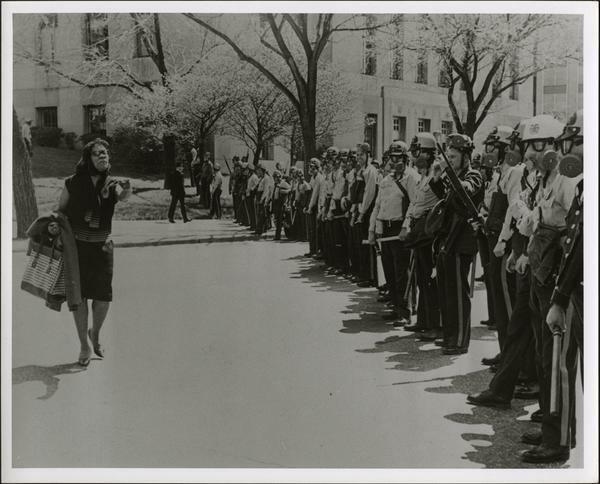 "These are great and powerful images, particularly given the political climate in our country right now," says Delia Gillis, who teaches history and directs the Center of Africana Studies at the University of Central Missouri — and wrote a book about Kansas City based on photographs from the Black Archives of Mid-America, where she serves on the board of directors. Gillis was particularly struck by the photo labeled "African-American woman in front of police line," which, she says, "harkens back to images we've seen coming out of the Black Lives Matter movement." "We still have images of the common man, if you will, standing up against the police state," she says. "On the one hand, particularly when it comes to protest issues, the police don’t represent the community and the individual — they're representing the protection of the state and property. 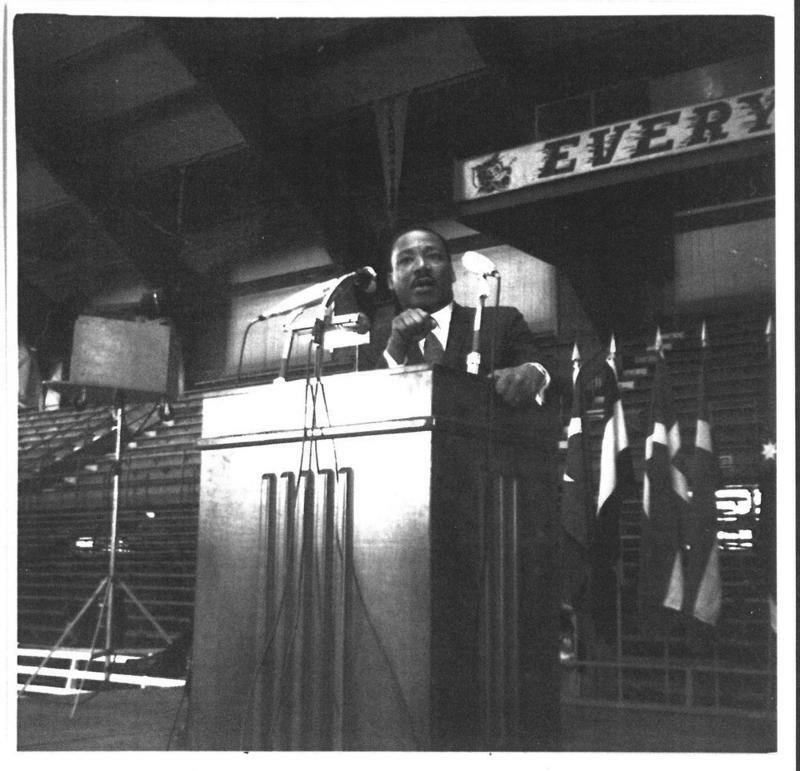 Unfortunately, 50 years later, that’s still the dichotomy of that." Gillis says the UMKC collection complements the photographs at the Black Archives. 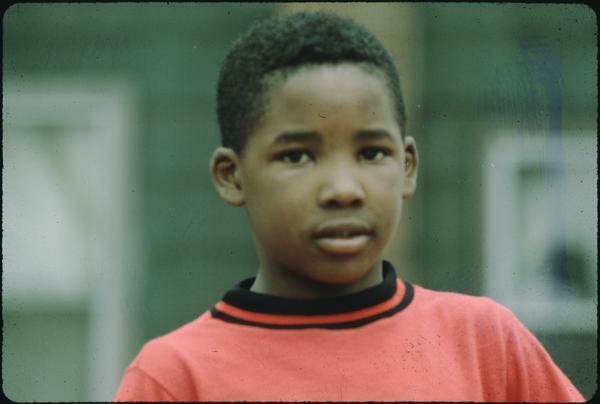 "We have beautiful images of the African-American community prior to this period: weddings, birthdays, church events, graduations, the social history of personal lives within a segregated community that flourishes." 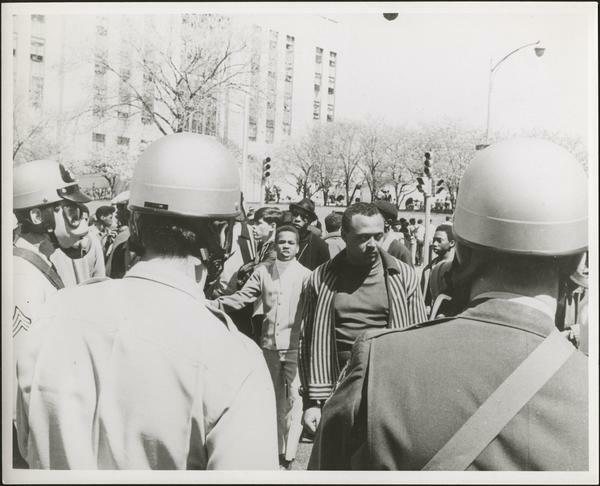 The Black Archives don't have many photographs from the riots, but they do have some documents, says, archivist Geri Sanders. 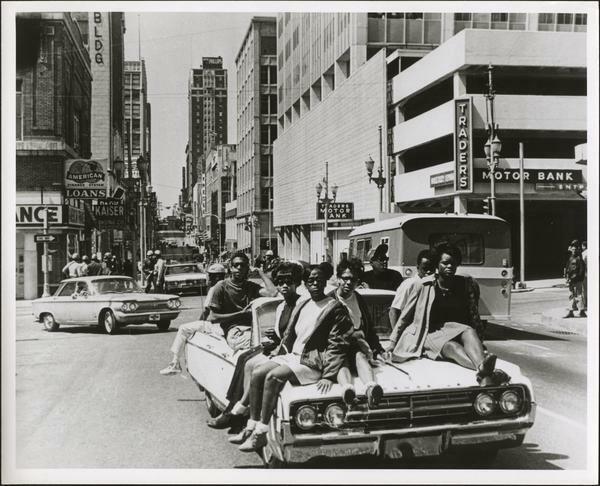 One file includes Kansas City Star stories reporting that five people had been named to study the riots. One of those names is Charles B. Wilkinson. It's his research with Robert Bechtel that's now in the UMKC collection. "Having this collection is great for community," says Gillis. 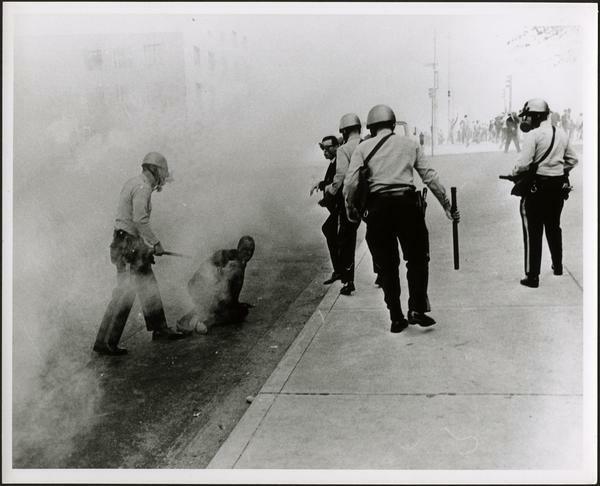 "We cannot overlook these images 50 years later, because we're still fighting the same fight. These images will make us rethink what’s going on today." Especially if we learn more about the experiences of the people who are in the pictures. Memories are fading. The library wants more information about its photographs, and KCUR wants stories in general. Correction: The original version of this story contained an incorrect reference to one of the pastors mentioned above. His name, as it appears in the UMKC archives, is Father Fly. A white police officer with his arm around the neck of a black man. Officers standing in a line, wearing helmets and carrying rifles. 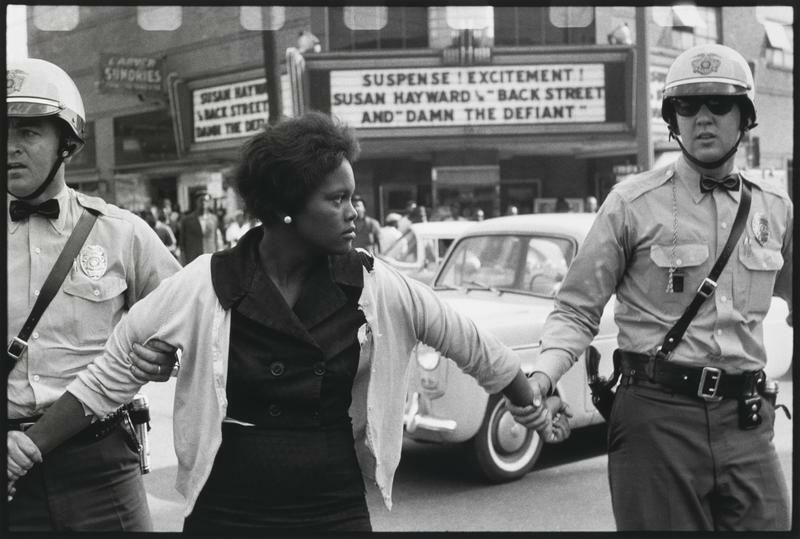 These images are not from photographs taken this year or last year – as you might guess – but during the Civil Rights movement many decades ago. The Nelson-Atkins Museum of Art, like many museums, maps out exhibitions in advance – often years ahead.